LONDON--(BUSINESS WIRE)--Roku, Inc. (NASDAQ: ROKU) today announced two new streaming players in the UK, giving people who enjoy TV better ways to connect to the streaming entertainment they love. Roku Express is the most affordable streaming player Roku ever launched in the UK, priced at just £29.99 MSRP. Roku Streaming Stick+ is the first Roku streaming stick that is capable of streaming HD, 4K and 4K HDR at up to 60 fps. Roku Inc. (NASDAQ: ROKU) pioneered streaming for the TV and aspires to power every TV in the world. As of the end of June 2017, Roku OS powered TV streaming for 15+ million monthly active accounts which streamed nearly 7 billion hours of video and music in the first half of 2017. Roku is known for streaming innovation and high customer engagement, offering content providers and video advertisers the best way to reach streaming audiences. 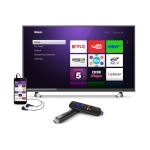 Roku streaming players and Roku TV models are available in 10 countries through direct retail sales and licensing arrangements with TV OEMs and service operators. The company was founded by Anthony Wood, inventor of the DVR. Roku is headquartered in Los Gatos, Calif., U.S.